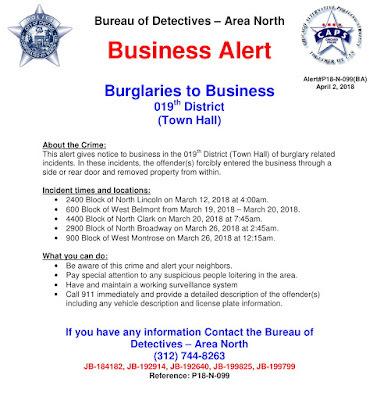 For the second time in four days, Chicago police are warning businesses in the 19th (Town Hall) Police District about after-hours burglaries. 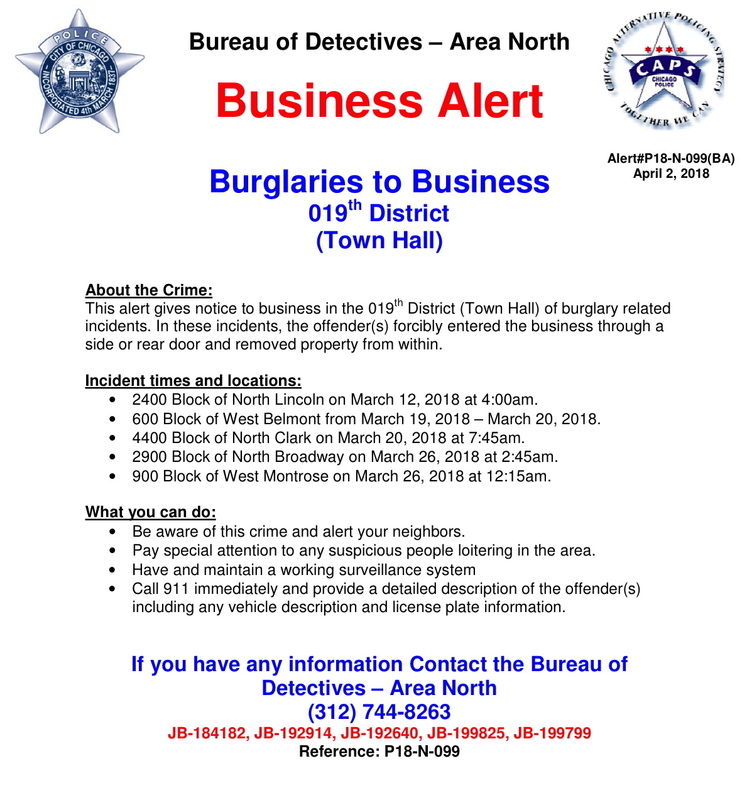 In the latest alert, issued this afternoon, police say they have connected a series of late-night and early-morning burglaries to a specific offender. The suspect—who is not described in the alert—has been entering closed businesses through a side or rear door, according to police. • 900 block of West Montrose at 12:15 a.m on March 26. At least two of the businesses have been cellular stores while others have included restaurants and salons. The alert advises residents to pay particular attention to people who are loitering in the area and to call 911 with descriptions of any suspicious people. If you have information about these cases, call Area North investigators at (312) 744-8263. Last Thursday, police issued an alert that connected at least 12 burglaries of 19th District businesses to another offender. One of the latest businesses to fall victim to the North Side business burglars is a salon in the 2600 block of North Clybourn. Police said that a masked burglar used a crowbar to bust into the salon around 5:25 a.m. on Easter morning. Once inside, the thief took a cash box containing currency and fled the scene on a bicycle, according to a police alert and witnesses. The suspect is described as a man of unknown race, wearing a black ski mask and a blue coat, on a black mountain bike. He was last seeing going northbound in the west alley of Clybourn. Police believe the same offender may also use a small Saturn SUV.